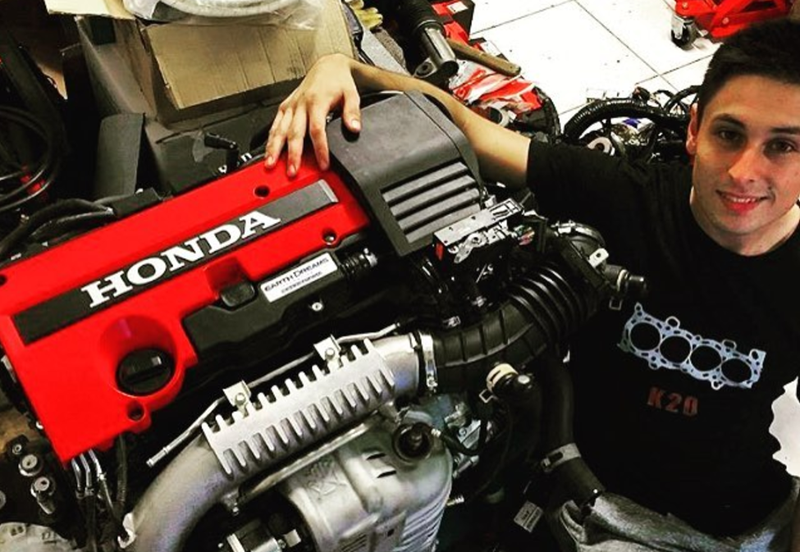 Miguel Carrera is a Santander, Spain-based 23 year-old automotive technician who’s in the process of stuffing a 306 horsepower Civic Type R engine into a 2,100 pound fifth-generation Honda Civic. It’s all part of an epic project aimed at achieving a power-to-weight figure on par with that of a Dodge Challenger Hellcat. It’s all a bit insane. Some people don’t get the appeal of the Honda Civic Type R. Why drop 35 grand on a front-drive sports car when you can get a Subaru WRX STI for the same price? Part of the answer comes down to interior space, fuel economy, and, most importantly, weight. (Not having to channel power from the engine to the wheels out back has clear advantages, even if “traction” isn’t one of them). But even the current Type R, at over 3,100 pounds, is far from a feather compared to Civics of yore, which is why Miguel—a student learning motorsports mechanics at Monlau Repsol Technical School in Barcelona—is going to combine the best thing about today’s Type R—the powerful motor—with the best thing about his 1992 Honda Civic Eg hatchback—its spacious and lightweight package. The engine, a K20C1 turbocharged inline-four from a wrecked 2015 FK2 Type R, is essentially the same motor found under the hood of the all-new 2017 Type R. Which means it’s a monster. His CV axles, for example, will be custom, as will be the spindles and the engine mounts. Between those specially-made parts, the radiator that he’s going to have to figure out how to package, and the fact that he has to devise a way to get the engine and all the accessories to fit under that hood, this build is going to be arduous. Just check out the image to the left in which Miguel is doing a bit of clearance-ing with an angle grinder to make room for gearbox bolts and to provide some space for the engine to move on its mounts. Miguel told me over messenger that he plans to replace some body panels with carbon fiber, swap out some engine pulleys as well as the flywheel and downpipe, and throw in a sequential gearbox at some point. Ultimately, he wants to reduce the weight of the car—which is 2,100 pounds stock, though the engine weighs 176 pounds more than that factory motor—down to under 1,940 pounds total. That will yield a power to weight of about the same as that of a 707 horsepower Dodge Challenger Hellcat. That’s just nuts. You can check out Miguel’s Instagram page, eg_k20c_built, to follow along as the young mechanic sets up the powertrain, and works to pull as much weight out of this 295 lb-ft monster (which he plans to race, of course) as he possibly can without going over his $17,000 budget. Correction: Miguel is actually changing the downpipe, and not the header (the engine’s exhaust manifold is integrated into the cylinder head).